In 2014 Glamour magazine created The Girl Project. The Girl Project is is a philanthropic global initiative that raises money to help young women all around the world receive a secondary education. The goal is to help the fifty million girls around the globe who are denied the right to an education.The Girl Project addresses the barriers girls face in pursuing an education by creating a way for women in the United States to support the education of girls all around the world. Our readers were energized by Malala’s bravery and wanted to know what they could do to help courageous girls like her. Educating girls is proven to grow communities and even cut out the roots of terrorism. The fact that a group of women in, say, Des Moines can send a girl to school in Pakistan is one of the most optimistic acts I can think of, and we’re proud to partner with these knowledgeable organizations to help make it possible. The Girl Project highlights the stories of these brave girls, calling them Girl Heroes. To read their stories click here. To find out more about The Girl Project click here. When we imagine the power of all our sisters standing together on the shoulders of a quality education — our joy knows no bounds. Gender and Women’s Studies and the Go Big Read program. Award and the Jefferson Award for Public Service. story of Malala Yousafzai in this year’s Go Big Read book, I Am Malala. be silenced and fought for her right to an education. information about the event can be found on the event calendar and at the Friends of the Library. Last week the United States House of Representatives passed the Malala Yousafzai Scholarship Act. The act encourages the State Department and U.S. Agency for International Development to continue to support Pakistani education initiatives, especially those for women. The act would also expand the number of scholarships available to Pakistani women under the Merit and Needs-Based Scholarship Program. The Act was named after Malala Yousafzai in honor of all of the hurdles she has overcome in her life to become the more prevalent education activist in the world. The next step for the act to become a bill is for it to be passed in the Senate. We will keep you updated on the Act’s status. The UW Lubar Institute for the Study of the Abrahamic Religions is hosting an expert panel today from 4:00-6:00 pm in the Sheldon Lubar Faculty Commons, Room 7200, in the UW Law School. 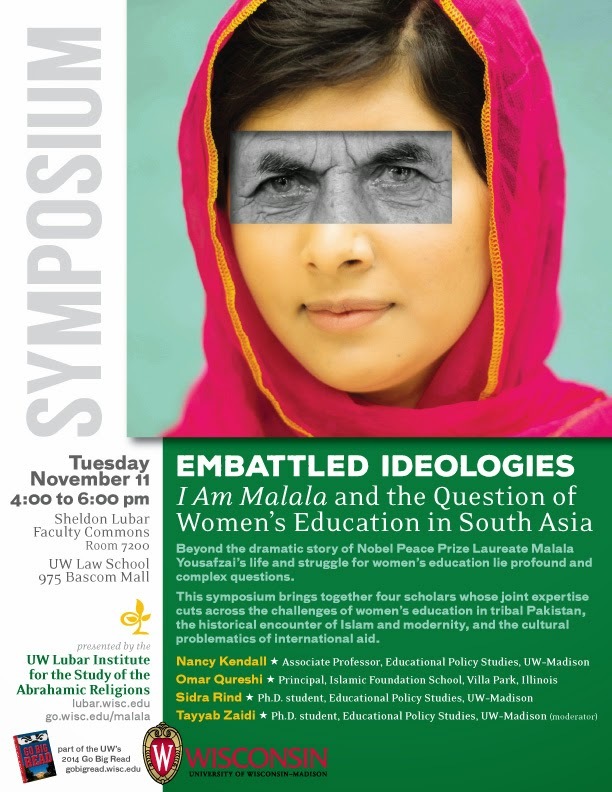 The event brings together four expert scholars on Islam and Education to discuss the challenging and complex questions surrounding women’s education in tribal Pakistan, the historical encounter of Islam and modernity, and the cultural problematics of international aid. If you are interested in a deeper intellectual conversation surrounding these issues you will not want to miss this event!